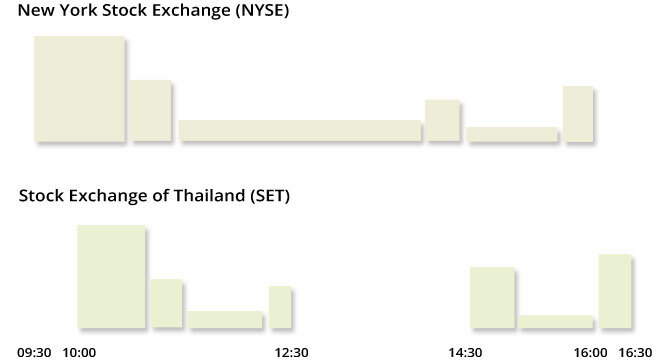 The Stock Exchange of Thailand is different from Western markets in many ways. One notable difference is that the SET closes for lunch. If you want to trade on the SET, it is important that you are aware of this characteristic, and the challenges and opportunities that it creates. It’s no secret that Thais love their food, and that cultural trait is well evidenced in the fact that the SET closes for a two hour lunch break every trading day between 12:30 and 14:30. If you have previous experience trading on Asian markets, you will already be aware of the closed for lunch characteristic. Like the SET, the exchanges in China, Hong Kong, Indonesia, Japan, Malaysia, the Philippines, Turkey, and Vietnam also close for lunch. However, if you are a new trader, or only have experience with Western markets, this article is a heads up that you have some additional stuff to learn. Recent studies have identified that 58% of all transactions on the New York Stock Exchange occur during the first and last hour of trading, with the greatest bulk occurring in the first 30 minutes after the market has opened. Mindful of this, it should come as little surprise that online advice offered frequently to traders in the West is that they should focus their efforts upon buying and selling in the first hour of the market. The Stock Exchange of Thailand however, is an entirely different kettle of fish. Unlike Western markets such as the NYSE, the SET has two opens each trading day. One in the morning, and then a second one at 14:30 in the afternoon. The net result is that the SET has its own unique waves of trading volume, and if you are planning to trade this market, it will prove useful for you to first spend a couple of weeks to familiarize yourself with those cycles. Trading volume in Western markets usually peaks in the first hour, there is then a significant lull between 11:00 and 14:00, a small peak around 14:00 when people have finished lunch and return to their screens, and then another peak in the half hour or so before the close of market. In contrast, the SET has two short trading sessions. The morning session is 2.5 hours and trading volume usually peaks in the first 40 to 50 minutes, there is a lull between 11:00 and 12:00 and then a peak around 12:10 just prior to the close of market for lunch. The afternoon session opens at 14:30 and is just 2 hours in length. Trading volume will peak again in the first 20 to 30 minutes, there is a short lull between 15:00 and 16.00, and then another peak in the half hour or so before the close of market. As mentioned at the start of this article, the fact that the Stock Exchange of Thailand closes for lunch creates both challenges and opportunities. Trading strategies that work in the first hour of Western markets can be successfully used twice when trading on the SET. However, the flip side of the coin is that trading volumes cycle quickly on the SET because there is both a morning and afternoon session, and each of these is very short in duration. If you are trading on the SET, make sure that you carefully plan your exits. For those of you who are used to trading Western markets, the brevity of trading sessions on the SET can come as quite a shock.